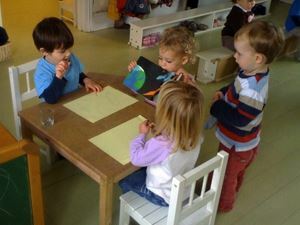 Infant Community are provided from fourteen months to three years. Before the child can walk the Nido provides low beds, floor mats next to mirrors with hanging mobiles, rattles and toys that encourage movement for the child to experience the freedom to move and to become familiar with his body. As he starts to crawl and then pull himself up there are bars and stools for support and to help the child to develop equilibrium. When he can walk the Infant Community provides opportunities to challenge his equilibrium with stairs and pushcarts and to develop eye-hand co-ordination with Montessori developmental toys that allow for activities that fascinate the child at this age such as posting and putting things in and out of drawers and puzzles. 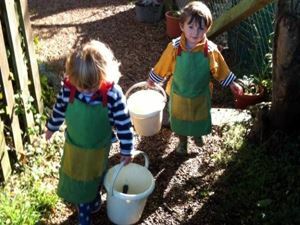 Children are helped to choose their own activities and allowed to repeat them for as long as their interest holds them there. 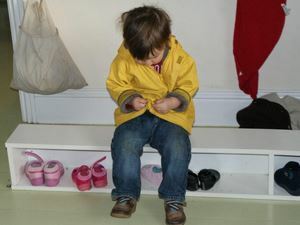 Children are helped to dress themselves by practicing with dressing frames that help them to button their coats and do up the velcro on their shoes. Child-sized utensils are offered to help them to take part in simple practical activities such as cutting a banana or squeezing an orange, cleaning the table, sweeping the floor and caring for plants and animals. These activities help children to gain confidence in themselves and develop the ability to act independently.